Need an impressive fall dessert – in a hurry? 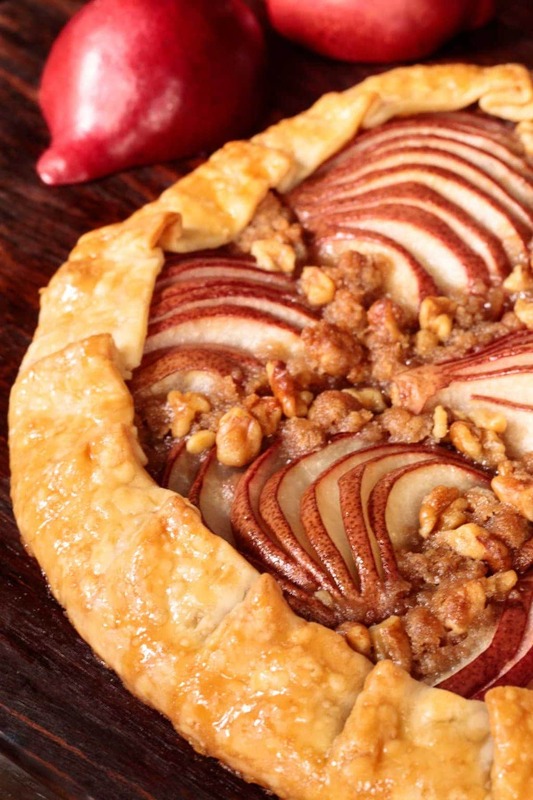 This beautiful Red Pear Galette recipe is easy – yet looks like it comes from a fine bake shop! Scott and I were on the road for the last two weeks and had a wonderful time visiting family in Wisconsin and Tennessee. Before boarding one of the airplanes, I picked up a Food and Wine magazine. It’s a fabulous collection of recipes and I enjoyed perusing through it on our travels. There was a pear galette recipe in the magazine that caught my eye and I couldn’t wait to get home and try it out. It didn’t take long, after unpacking our bags, to crank up the oven, pull out the pears and start baking. I was disappointed with the results though. The galette took a long time to make and didn’t turn out looking anything like the pictures. I had purchased plenty of pears, so I decided to come up with my own version. Three galettes later, I’m quite happy with the results and I think you will be too! What exactly is a galette? Wondering what makes a galette a galette? Why not call it a tart or a pie or a crumble? Bon Appetit says that “If a crusty cake and pie had a baby, it’d be our favorite freeform dough creation: the galette.” Freeform is the key word here. A galette is not made in a pan or a baking dish. They’re made with a single crust of pastry or, sometimes, bread dough. Galettes are rustic, charming, fun and EASY – as you don’t have to worry about blind baking, fitting the dough into a pan or fancy crimping. 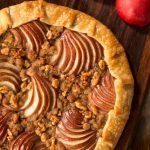 And when you cheat a little (like I do in this pear galette) and use a packaged, refrigerated pie crust, the whole thing is even easier! 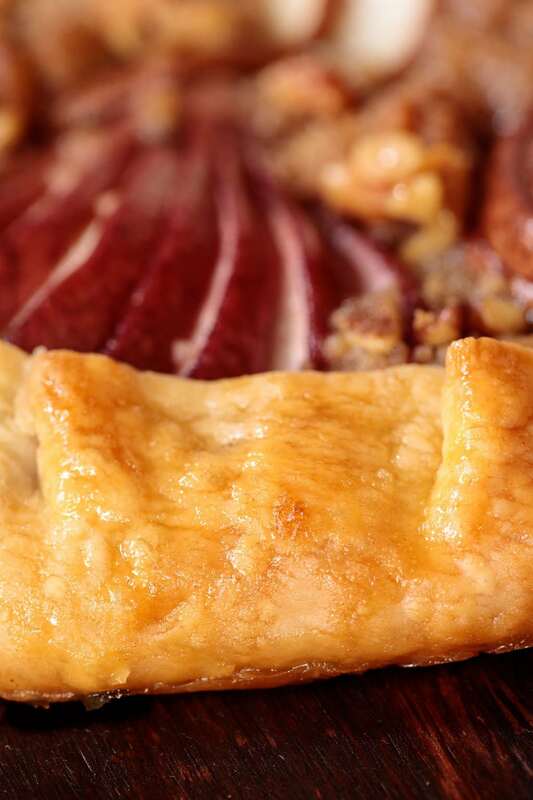 Don’t worry, everything about this red pear galette is fabulous, including the sweet, crisp, buttery tasting crust which is achieved by brushing the entire tart with a maple/butter glaze towards the end of the baking time. I used an easy technique to slice my pears for a pretty presentation. I cut each pear in half and removed the cores. Then, using a small sharp knife, I sliced the pear halves fairly thin leaving about 1/4-1/2 inch intact at the stem end. The partially sliced pears are easy to fan out and arrange on the crust. The effect is quite artistic looking – even for a non-artist like me! If you’re in a big hurry, no worries, the galette will be just as delicious if you simply slice the pears and pile them on the crust. So pick up a package of pie crust and a few red pears next time you’re at the market. You’ll also need a bit of pure maple syrup, cinnamon, sugar, flour, and butter. That’s it! A delicious, easy dessert is less than an hour away! For a pretty presentation, look for smaller pears. You’ll often find small red pears in bags at the market rather than being sold individually or by the pound. The pears do not have to be super ripe for this galette. Choose deep red pears with a smooth skin. 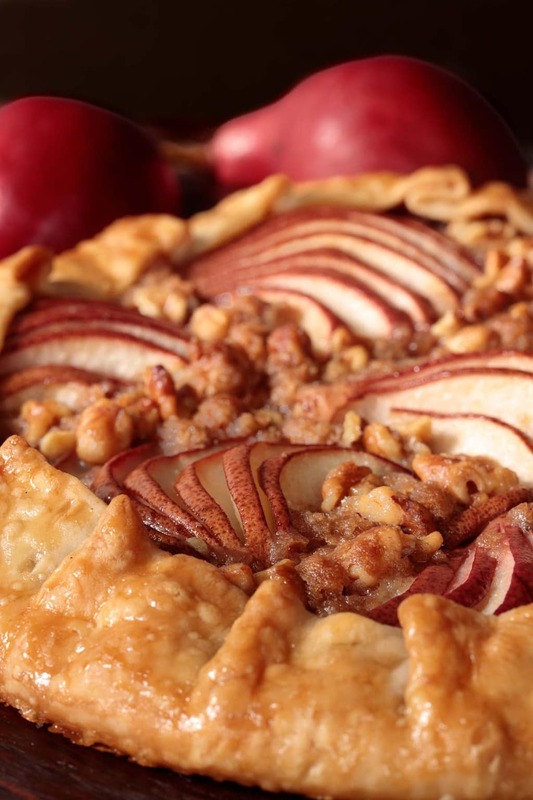 When arranging the pears on the pie crust, don’t worry about filling every square inch with fruit. The spaces in between are the perfect little crevices for the crumble. To cut the pears so they’ll fan, use a small, sharp knife. Start on the right side of each pear. After cutting each slice, use the knife to move that slice over to the right just a bit. This will make it easier to see where the next slice should start. In a hurry? Just half, core and slice the pears and pile in the center of the crust. Sprinkle with the crumble. Just be sure to leave a 1 1/2-2 inch border to fold up over the pear slices. This galette will keep well at room temperature for 6-8 hours. After that, the crust can get a little soggy but will still be delicious. I love these pre-cut sheet pan liners. 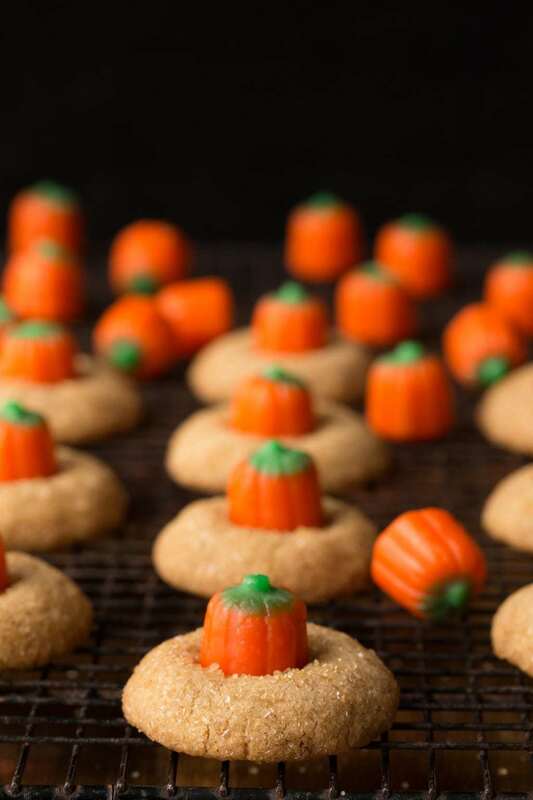 It makes clean up super easy when making cookies, tarts, galettes and lots of other baked goods. They’re inexpensive, last forever (Unless you’re a crazy cook like me!) and come in a flat box for easy storage. Preheat oven to 425˚F. Line a sheet pan with parchment paper. Combine 2 tablespoons of melted butter and the maple syrup together in a small bowl. Set aside. Combine remaining melted butter, flour, chopped walnuts, brown sugar, cinnamon and salt in a medium-size bowl. Stir with a fork until ingredients are combined and wet crumbles form. Set aside. Place pie crust on a lightly floured work surface. Roll to a 13-inch circle. It’s okay if it’s not a perfect circle. This is a rustic tart. Fold crust in quarters and transfer to prepared sheet pan. Arrange the pears decoratively on top of the pie crust, fanning them out to lie fairly flat. Leave a 1 1/2-inch border of crust around the perimeter. Cut pears in half vertically if necessary to make them fit. Brush the pears with half of the reserved butter/syrup mixture then sprinkle with 1 tablespoon of sugar. Set remaining butter syrup mixture aside. With your hand, sprinkle crumble mixture into crevices between pears and into any open areas along the perimeter of the pears. Try to keep most of the sliced pears exposed for a pretty presentation. Fold the edges of the dough up and over the filling, pleating edges when needed. The center should remain open. Place in preheated oven and bake for 20 minutes. Remove from oven and slowly brush all over with the remaining butter/syrup mixture. Return to oven for another 5-10 minutes, or until crust is golden and glazed. This tart came out simply amazing. It fit all of our family’s criteria: no dairy; no egg yolks. I brought this to my sister’s house for pre-Christmas gift exchange. Everyone mistook it for a pizza! Lol! My 5 year old nice complimented after it was served… “what a beautiful ham!”. The pears in The galette DID resemble little spiral sliced hams. Initially, we thought we were only going to eat half of the galette… we had been so stuffed from the feast. But towards the end of the night when we were packing away the food, the pear galette got eaten away. Success!! I wouldn’t change a thing in this recipe!! Thanks so much, Mimi! So funny that they thought it was pizza! Chris, This is a delicious recipe. I too saw it in F&W but hadn’t gotten around to trying it yet. I served your version last night to my family. It was quite easy, with cutting the pears being the most difficult part of it. 🙂 But, the outcome was wonderful! Our daughter, a pastry chef, and her husband were over for dinner and when she put the first bite in her mouth, she just went, “mmmmmmmm…” So, a major hit. I served it with a small scoop of good vanilla ice cream. I made the recipe exactly as written – wonderful just as it is. Oh, what a nice compliment that your daughter enjoyed this! Thanks so much for sharing your results, Sue! I love making galettes in the fall and this one is such a beauty! Such a pretty way to fan the pears! I love pear season and it’s my husband’s favorite fruit. I”m sure your family was happy to eat your less-than-perfect trial runs, Chris 🙂 This one turned out perfectly! Oh Chris this is just lovely! I love the presentation, the pears, the crumble – the perfect fall treat! I love the color too – bravo! Such a gorgeous dessert, I love those pretty red pears you used Chris ~ kudos to you for working through a fail, so often I just give up! Absolutely perfect! Love galettes and the red pears are so pretty 🙂 Will be trying this one. 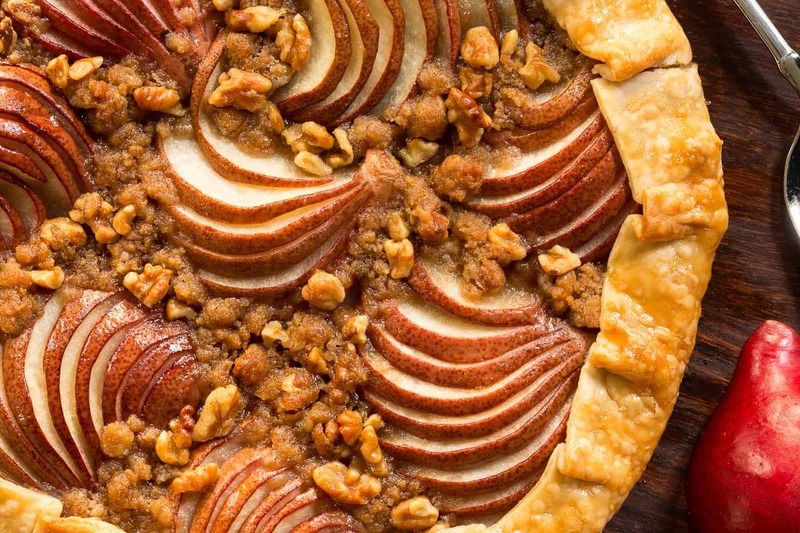 This looks absolutely amazing with those pretty pears and crumble! 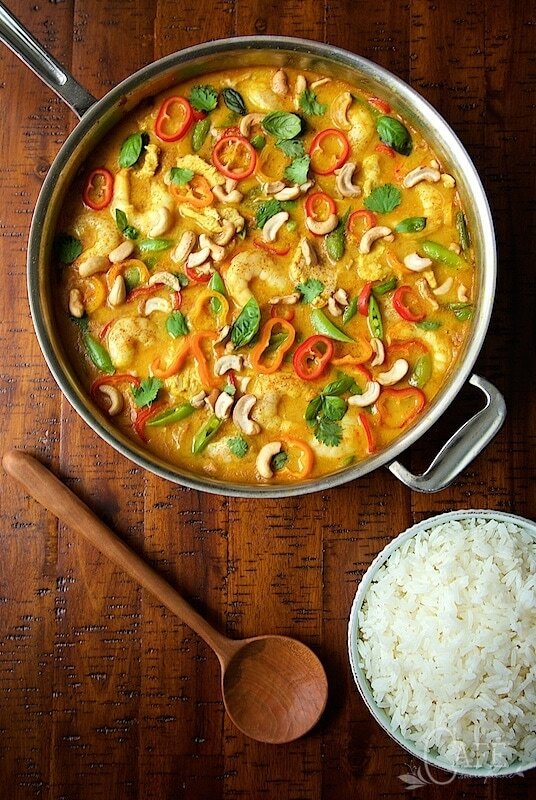 This looks beautiful and sounds delicious! One question, does the pear peel get tough when it’s baked? Hi Donna, with the pears I’ve used, the skins soften up when baked. We enjoy pear desserts with the skins on but you could definitely peel them for this galette if you prefer. Enjoy! This is a beauty Chris! 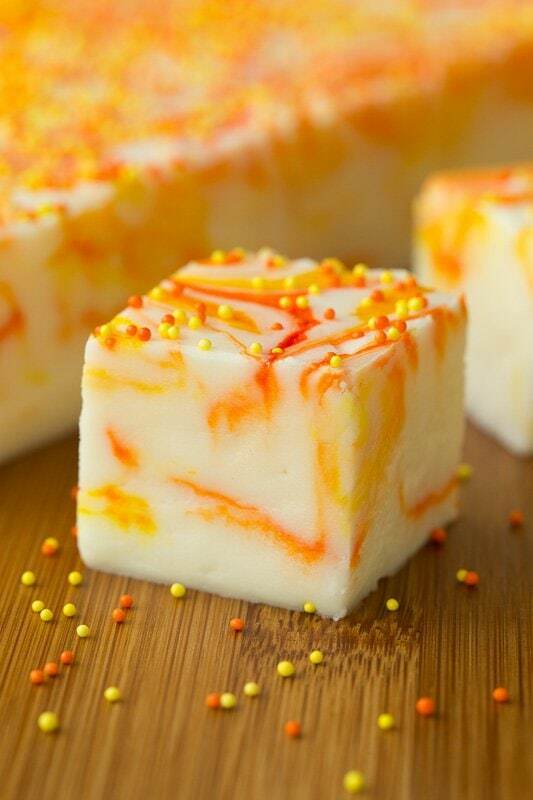 Thanks for this lovely fall dessert. Could I substitute apples for the pears? Thanks, too, for recommending a packaged pie crust. I’m a “from scratch” grandma. but if you recommend it, I’m sure it will be fine–and so much less work. Question: I clicked on the link for your favorite parchment paper, but could only find the quarter sheet size. I need at least 12″ X 16″ sheets for high-heat bread baking. Any ideas? Hello Susan! Yes, you could definitely sub apples for the pears. It would be delicious. If they are tart apples, you may need a bit more sugar. Regarding the pie crust – it’s funny, years ago I would have never dreamed of using a packaged pie crust. But these days, I’m always looking for ways to make things quicker and easier without sacrificing flavor for our readers but also for myself. It seems that life just gets busier and busier! Would a homemade crust be better for this recipe? Maybe. But honestly, with the maple/butter glaze, it’s really delicious! And way… easier! And thanks for noticing the pre-cut parchment paper link. I changed it, it should have been for the 12×16-inch size. Your red pear galette looks wonderful. I do have one question, though. We were gifted 30 pounds of local Bartlett pears AFTER we ordered a box of them from an organic orchard here in Washington. Is it possible to make your recipe with Bartletts, or are they too juicy? Thanks so much for all the fantastic recipes you so generously share with your readers. Wishing you and your hubby many blessings in your new home and a fantastic holiday season. Hi Kin, I think Bartlett pears would work great. I would use ones that are super ripe though as those could get too mushy.